Becky Hobbs sits anxiously, all keyed up, at a piano bench, appearing on the Music City Tonight TV show. The green light appears. After a glissando or two a la Jerry Lee Lewis, the Beckaroo is off and running. Her songs are about Mama and Daddy: "She Broke Her Promise," "Mama Was a Working Man," (no suggestion of cross-gendering or operations) and "I Got My Daddy's Blue Eyes and My Mama's Wild Hair." Oklahoma-born, piano-bashing Becky Hobbs has her mama's green eyes and her daddy's wild red hair. She also has a strong belief in angels, as indicated in the hit "Angels Among Us," recorded by Alabama. 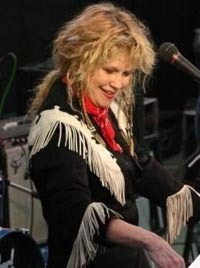 She has sung duets with Moe Bandy and has written at last count, some sixty songs. However, country radio has done it again – shut the door to the veteran performer and opened the gate to the same-sound-every-time crowd. When politics actually match personhood, the person should be noticed. It's one thing to play "backseat politician"; it's another to preach while one is engaged in the actual conflict. Becky Hobbs is not just a great performer who is quite entertaining; she is a stateswoman, of sorts. She cares about the plight of her fellow countrymen and countrywomen – be they city dwellers or inhabitants of an Indian reservation. And she has a new song called "No More War" which is available from her website, www.beckyhobbs.com. The redheaded songbird moves from loving, leaving, looking, and lamenting to commenting on the futility of war among people who really want peace. Although this song notably is an entrée into a new battle zone (normally is apolitical except for her embracing Native American culture/bloodline), the subtext of "No More War" really reflects her lack of modern country radio airplay. She is fighting the battle of the independent artist who has no entrance into the corporate-run megalopolis called "mainstream country." Great songs like hers are just not receiving airplay. Hobbs' take on the on-going skirmish between the music and the business is optimistic: she knows her music is superb, her fans know her music is superb, her band (which includes her husband, Duane Sciacqua - who played guitar for the Eagles and with Paul McCartney) knows her music is supremely great. However, the bastion of popular country knows her not. In the mid-nineties, her debut album All Keyed Up was applauded in pop culture magazines like People. Today, of course, the country Mafia only give positions of honor only to a select, bland few and really great performers are tossed aside. Like her fellow fighting women through history, Hobbs puts on the boxing gloves of self-expression. She is actively performing and waging war against the hit machines. "If women ruled the world…" she writes in "No More War" no doubt suggesting that women would do away with the barriers men erect. However, a male dominated society remains, at best, is uneasy with female power and Becky has to take matters into her own hands to send out her message. Will there ever be a time when war is no more? Scripture indicates so. Will there ever be a time when Becky Hobbs will win the war and be heard as she should be? Society indicates… well, the future's unwritten. One can only hope that by the power of the World Wide Web, this Oklahoma piano-stomping vocalist can get her message of love out to a world that needs it badly. The Beckaroo rocks on and the sound of war continues.